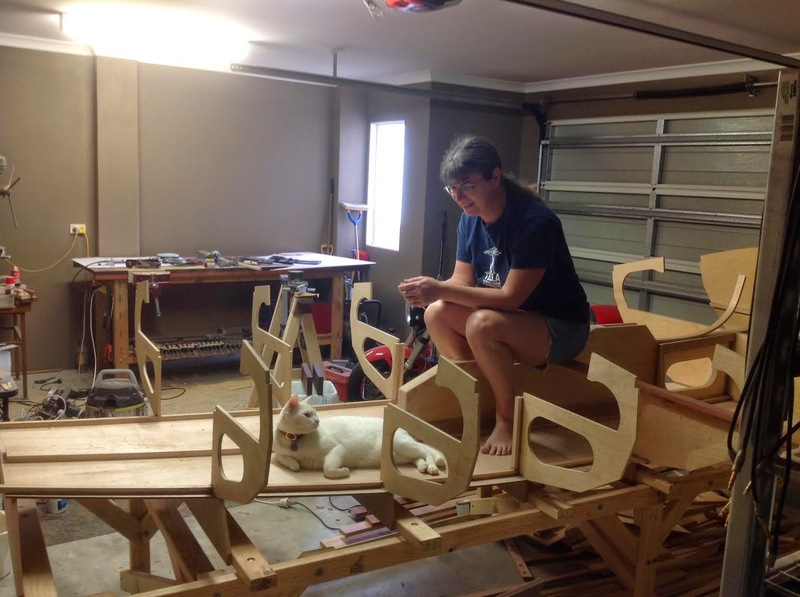 Suzy's Blog: Yay, the last of the bulkheads. Installation of bulkhead 8 prompted a moment of contemplation by me with the project supervisor, Mogget. I'm glad to say he's happy with the progress being made on his newest cat toy, and is enthusiastic about the upcoming installation of fishy smells and places to hide. We celebrated by cutting out the cockpit seat fronts and installing those, along with more 19x19 bracing. John's offsets were spot on for the cockpit sides. I just drew them, cut them out, took a couple of light cuts with the plane, then epoxied them in place. One change I made from plan is to do the seats as a single piece extending all the way forward to bulkhead 5. This is because I'm doing the rowing thwart differently, so there's no cross brace at bulkhead 6. For that matter, there's no cross brace on bulkhead 8 either. I've elected to maximise the cockpit floor space, with the hope that at some point It'll make a semi-comfortable place to sleep while afloat. Here's my latest weapon of choice for cleaning up these subtle boat-like concave curves. It's a Canadian Veritas spokeshave. A truly wondrous bit of kit. Beautifully made. Here I've just used it to trim the cockpit seat fronts flush with the bracing. I wouldn't have been able to do that with my normal planes, as it's an inside curve. I used some clamps back to front to hold the end of the cockpit seat front against bulkhead 5. I haven't been much of a fan of these clamps up until now, because they're a bit flimsy. The ability to do this has given me new respect for them. Another project that I knocked over while avoiding cutting out the rest of the bulkheads was a bit more work on my bench. I added a plank, taking the width from 750mm to 825mm, and added some 30x40 Jarrah lips to the front and back, which allow me to clamp things to the face of the bench. Then I went at it with my wonderful Stanley number 7 plane until it was perfectly flat, and finished it with a simple mix of gum terpentine and boiled linseed oil. I also bought a Dawn Wilton woodworking vice, which I've attached under the left side. The Dawn vice, while very nicely made, was disappointingly not made in Australia, as I was led to believe from their website. Instead it's Taiwanese. It's also actually a Wilton, branded Dawn. I like the vice, but I'm a bit miffed at being mislead about its origins.